Summary: (1) The economics of energy will trump Trump. (2) The book hits all the important issues but lacks in-depth analysis. (3) The book lacks self-criticism of the environmental movement. The main theme of the new book by Mike Bloomberg and Carl Pope is that the economics of energy will trump Trump, which is important. Several decades of development have set the course for new directions in energy technology and while the Trump administration can attempt to turn back the clock, they cannot retroactively undo the developments that have already permanently altered the economics of energy going forward. In other words, the main hope in Climate of Hope is that in the post-fact world of the Trump administration, there may be some setbacks for climate efforts, but they will at most be limited and temporary. The US is likely to meet or exceed the Paris goals by way of city and state policies if the federal government becomes totally dysfunctional as it is presently rapidly doing. What the book altogether lacks is any self-critical analysis into the failures in environmental policies of the past and why Trump is even possible although it occasionally alludes to some of the issues. Clearly, shutting down coal-fired generation cannot be done without a serious effort towards economic development for the coal-mining population. Bloomberg at least understands that and his initiatives are likely to be more useful than the Trump administration’s empty promises to bring coal-mining jobs back from the dead. Those will at most make things worse temporarily. Even if there is a short-term revival in coal, as is already somewhat evident, in the longer term automation more than anything is likely to limit the impact on employment for coal miners, so that re-educating miners and other related initiatives at creating new economic opportunities for them are more important than promising them something that cannot be delivered. Moreover, subsequent administrations are likely to completely abandon any efforts in support of coal all over again, as it remains uneconomical (when is Trump Tower switching back to coal?) – and very few investors will be swayed in making decisions that take decades to pay off by a short-term blip in energy policy. 2. 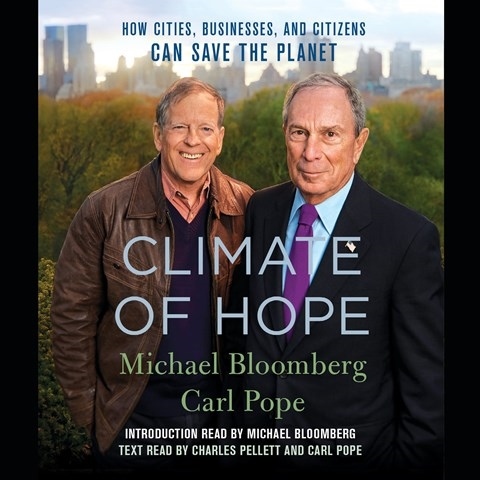 From Amazon: Mayor Michael Bloomberg and former head of the Sierra Club Carl Pope comes a manifesto on how the benefits of taking action on climate change are concrete, immediate, and immense. They explore climate change solutions that will make the world healthier and more prosperous, aiming to begin a new type of conversation on the issue that will spur bolder action by cities, businesses, and citizens—and even, someday, by Washington. “Climate of Hopeis an inspiring must read.” —Former Vice President Al Gore, Chairman of The Climate Reality Project. “Climate change threatens to reshape the future of our world’s population centers. Bloomberg and Pope have been leaders on fortifying our cities against this threat, and their book proves that victory is possible—and imperative.” —Leonardo DiCaprio. “If Trump is looking for a blueprint, he could not do better than to read a smart new book, Climate of Hope.” —Thomas Friedman in The New York Times. 4. Review by Goodreads: In 2006, the documentary An Inconvenient Truth set off a heated political debate when it threatened that inaction on climate change would lead to a dark and frightening future by 2016.Well, that ten-year window has closed—and we have neither resolved the threats to our climate, nor gone past the point of no return. To Mayor Bloomberg and Carl Pope, it’s clear that to treat climate change as either a lost cause or a non-issue is the wrong approach. Global leaders are stymied by the enormity of the doom-and-gloom scenarios. So what happens when you tell leaders that they can definitely—right now, this year—reduce the number of children who have asthma attacks, save thousands of Americans from dying of respiratory disease, cut energy bills, increase the security of our energy supply, make it easier for everyone to get around town, increase the number of jobs in their community—all while increasing the long-term stability of the global climate? That is actionable. That future is within our grasp. The changing climate should be seen as a series of discreet, manageable problems that should be attacked from all angles, each with a solution that can make our society healthier and our economy stronger. In these times, when it’s less and less clear if the federal government will be willing to tackle climate change, Bloomberg and Pope lay out a powerfully persuasive argument about how cities can play an outsize role in fighting and reversing the dangerous effects of a warming planet. Together they lay out the economic and personal health reasons for businesses and individual citizens to support climate change action plans.